After all, there’s very few things grandmothers love more than their children and grandchildren. And most women adore jewelry – and they can always use some more! This elegant heart-shaped pendant is a lovely way for grandma to express her love for her grandchildren. On the other side, the names of up to 15 grandchildren can be added. Surrounding the heart are 15 smaller heart-shaped links in an open design which can feature the Swarovski crystal birthstone of a grandchild. The open design allows the brilliant birthstones to be seen from both sides of the pendant. 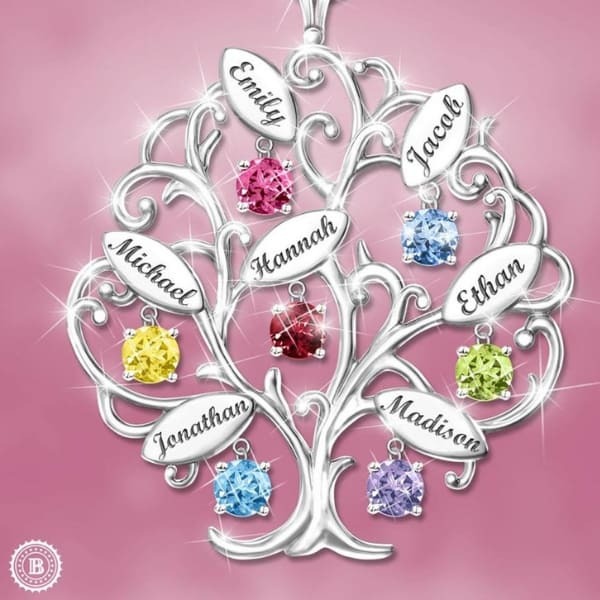 This unique family tree necklace makes a wonderful gift from the whole family. Exquisite solid sterling silver features a sure-to-be-commented-upon striking family tree design. Each leaf features the name of a loved one – you can add up to 7 family members. The branches are further accented with crystal birthstone charms. This lovely stackable charm necklace is the perfect way for grandma to have a special token representing each one of her grandchildren. You can fit up to 14 charms on this necklace. As a new grandchild is added to the family, another beautiful birthstone charm can be added. 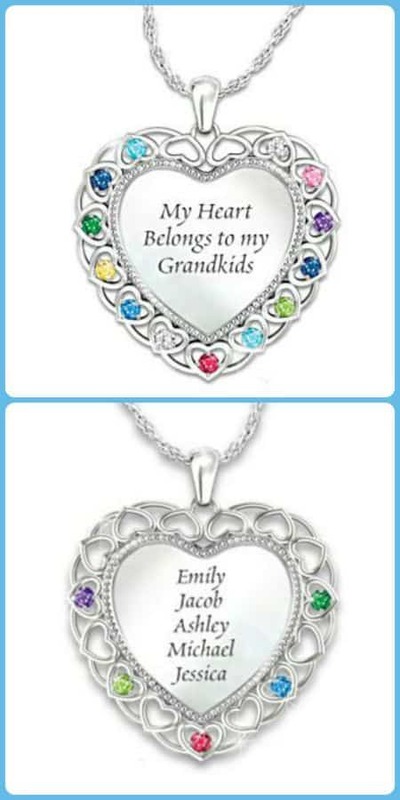 When you think of Grandma, you think of unconditional love – so a heart-shaped pendant with her grandchildren’s birthstones is a meaningful gift. This lovely pendant features a small delicate heart at the top of the larger open heart that gently cradles Grandma’s birthstone. The children or grandchildren (up to 7) are represented by sparkling Austrian crystal birthstones that slide freely at the bottom of the larger open heart. Available in 14k gold plated (as shown), or ​sparkling sterling silver. 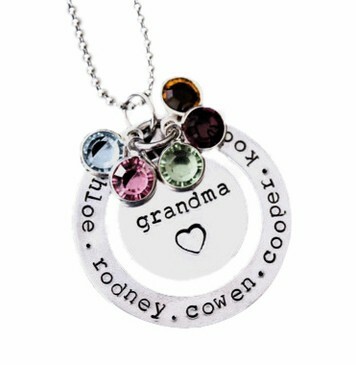 Grandma will love this trendy birthstone necklace that can be personalized in a number of ways. 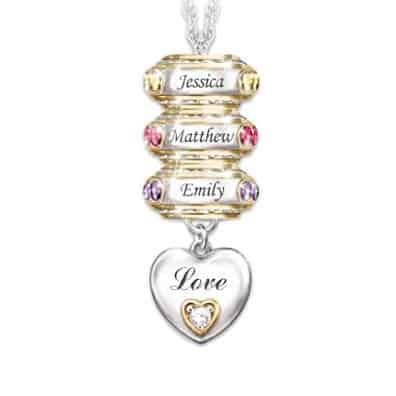 On the perimeter of the circular pendant, you can engrave it with the names of up to five grandchildren. Accompanying that, up to five birthstones made from dazzling Swarovski crystal can be added. 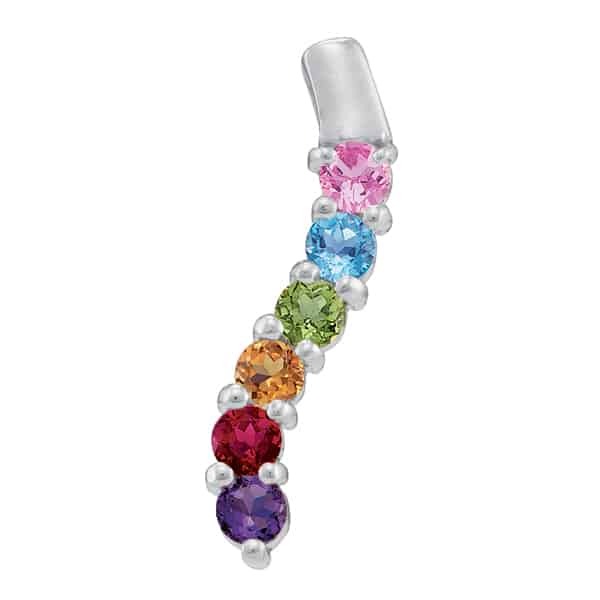 The birthstones reflect brilliant color as they dangle at the top of the pendant and catch the light. The middle of the pendant can have any word engraved in the middle. Combine Grandma’s faith and her love for her family in one thoughtful gift! A solid sterling steel cross is accented with 24k gold plating. 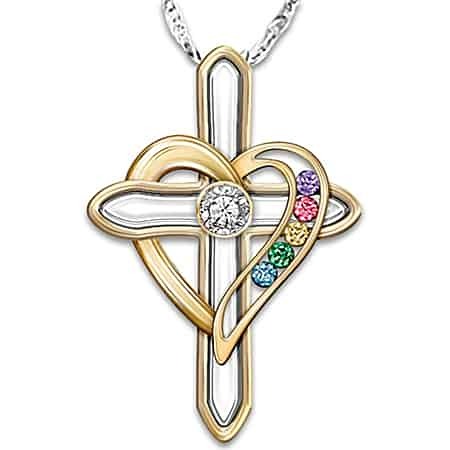 The cross is surrounded by a heart adorned with up to 6 birthstones of her loved ones. A shimmering genuine diamond accents the center of the cross. A meaningful accessory that any woman is sure to love wearing! Grandma will be delighted to show her love for her grandchildren with this stylish birthstone pendant. Each roundel charm is plated with 24K-gold and personalized with the name and birthstone of a grandchild in sparkling Swarovski crystal. Up to six charms can be added to the silver-plated chain, which are also removable and interchangeable. Anchoring the necklace below the charms is a shiny silver-plated heart charm that has the word “Love” engraved on one side and the touching sentiment “My Family, My Joy” engraved on the other side. Grandma can celebrate the family’s unity with this exquisite family tree pendant – available in both yellow gold and hard-to-find rose gold. The outer circle is engraved with up to 10 grandchildren’s names. 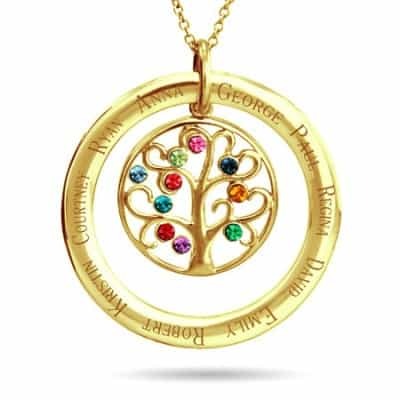 Dangling gracefully inside the circle is a delicate family tree accented with the corresponding Swarovski birthstones. Perfect last minute gift – same day shipping is available! Click here to see this necklace in rose gold. 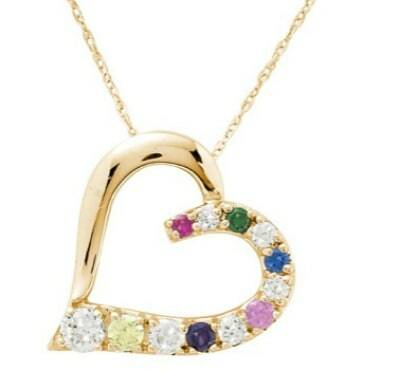 Grandma can cherish the bond with her grandchildren with this gorgeou heart-shaped birthstone necklace. The open-heart pendant in sterling silver can be elegantly engraved with up to 6 names on one side. A beautiful genuine diamond adorns the tip of the heart. 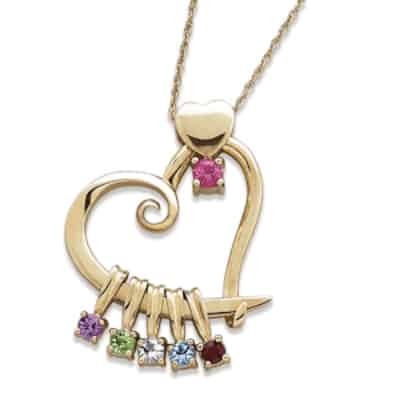 Dangling from the middle of the heart are the respective birthstones of each grandchild. This gorgeous diamond and birthstone pendant is sure to please almost any Grandmother. 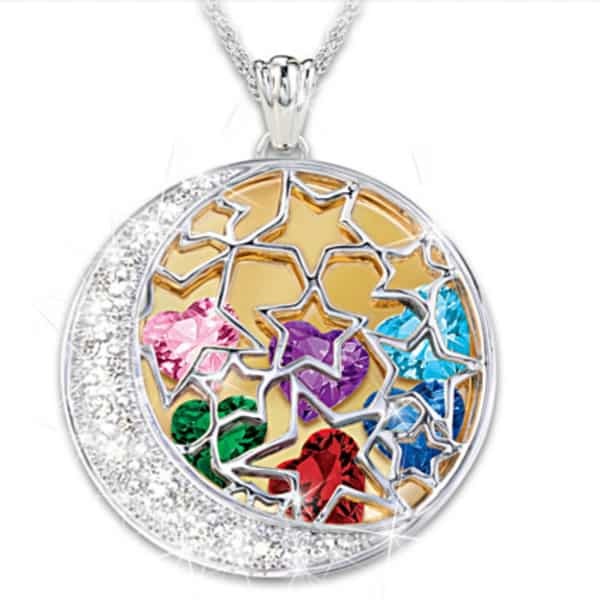 The inner circle charm is encrusted with genuine diamonds and up to 5 family member’s Austrian crystal birthstones. The outer circle features the grandchildren’s names laser-engraved in a striking script. This lovely pendant is available in your choice of 14k gold plating or sterling ﻿﻿silv﻿er, so you can choose whichever style she prefers. A wonderful gift for Christmas, Mother’s Day, or any memorable occasion. Perfect for the growing family or the Grandma with a lot of grandchildren. With many necklaces you’re restricted to a certain number of birthstones. That’s not the case with these adorable 14k baby shoe charms – order as many as you like! If a new baby is born in the family, you can order another charm. Each 14k gold charm features genuine gemstones. 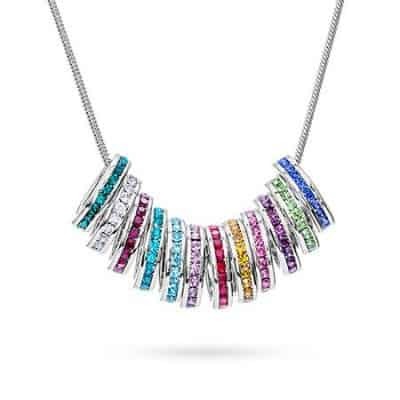 This contemporary pendant is a great choice for any woman with 6 or fewer grandchildren! Striking necklace is available in your choice of shimmering gold plated or sparkling sterling silver. 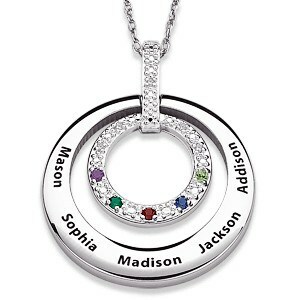 The circular pendant features up to 6 birthstones and names leading up to an elegant heart in the center of the charm. The tiny details make all the difference in this sentimental personalized necklace. 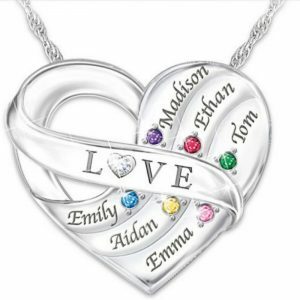 Thrill your grandmother or Mom with this stunning heart necklace that features her grandkids' names and birthstones all nestled together in a heart-shaped charm. The word "Love" is engraved on the center ribbon and has a genuine diamond that sparkles in the center of the "O". 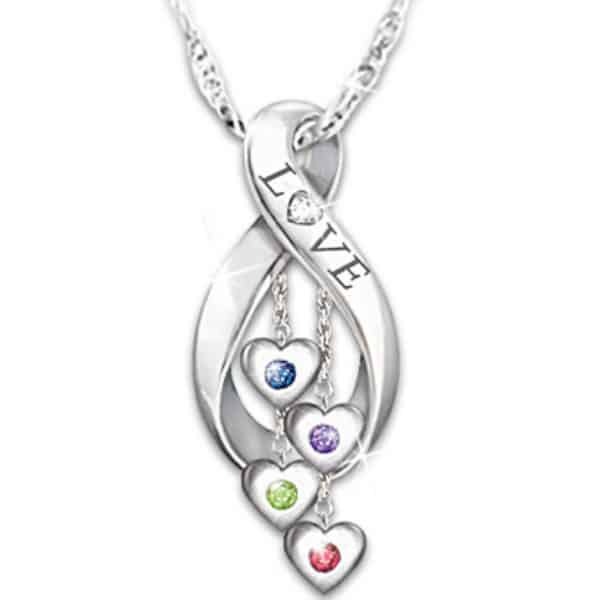 This beautiful infinity pendant is the perfect way to symbolize grandma’s endless love for her grandchildren. The pendant can be personalized with up to 6 birthstone charms that dangle from the center. A glistening genuine diamond sparkles in the middle of the letter "O" in the word love. If your grandmother has a classic sense of style, she’ll appreciate this lovely heart-shaped necklace. The traditional heart charm is updated by being tilted slightly to the side for an strikingly unusual piece of jewelry. It features up to 12 genuine birthstones, so it’s a great choice for the granny with a larger family. Expertly crafted in your choice of 10k or 14k yellow or white gold. An heirloom quality pendant that will be treasured for generations! 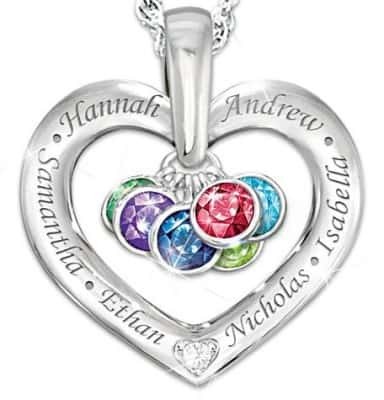 This unique birthstone locket necklace makes a wonderful gift from the whole family. The sterling silver locket features a lovely open filigree design with shows off the colorful birthstones inside. Add up to 10 birthstones – perfect for the grandmother with a larger family! Every time grandma sees this lovely birthstone pendant, it will remind her of her many blessings through her grandchildren. Choose between sparkling Swarvoski crystal birthstones or genuine birthstones. 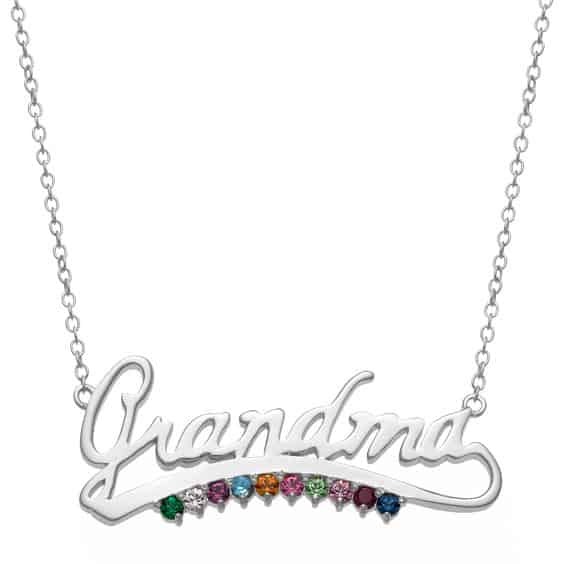 Up to six gemstones can be mounted onto the sterling silver chain in the order of the grandchildren’s birth or in any desired order. This great-looking pendant features the name "Grandma" or "Nana" fashioned in an elegant cursive script. Up to 10 birthstones sparkle cheerfully underneath the name. Click here to see this necklace for Nana. Delight your grandmother this year with this beautiful birthstone locket. 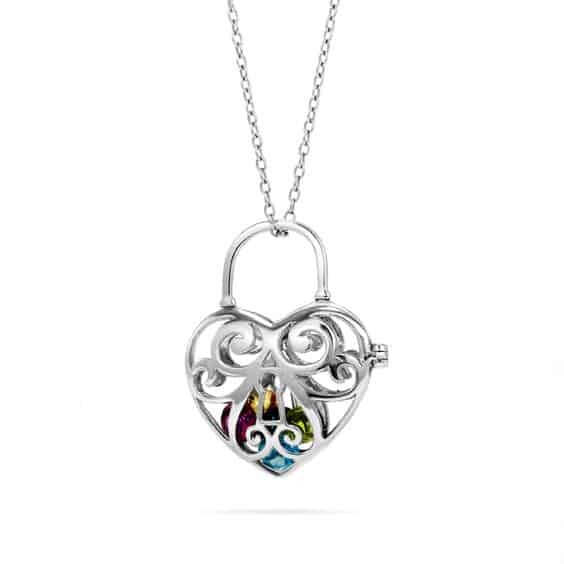 Sterling silver charm holds up to 6 heart-shaped birthstones that move freely inside the locket. 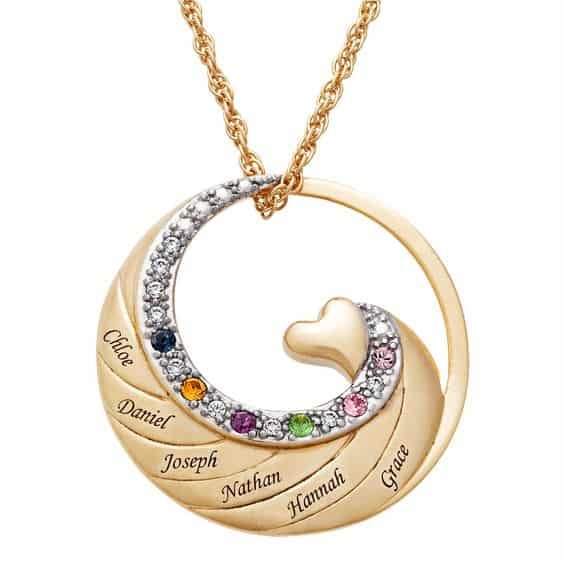 "I love my Family to the Moon and Back"
The grandchildren's names are also engraved on the back to create a custom necklace just for Grandma.